A recent Google search threw out millions of hits for ‘leadership’ yet significantly less for ‘followership’. Considering the majority of employees (and one can effectively argue leaders too) are followers, you would expect it to be the other way around. Furthermore, one could argue that in order to be an excellent leader and understand leadership, one must fully understand followership. Some authors have gone further by stating that followership is as important as leadership, with a handful even claiming it is more important. The concept came into the mainstream business community in 1960 and into educational research in 1984. Before more is written, it is pertinent to point out that although the word itself, ‘followership’, may sound patronising, it is not intended to be at all. For this article, it simply means somebody in a non-management position. Other terms that have been used instead of followership are non-leaders, non-managers, subordinates, members, less-expert peers, observers, contributors, stewards, partners and servant-leaders (by Robert Greenleaf). Exemplary (and Effective): Thinking independently, using their initiative and questioning professionally, exemplary followers are actively engaged in the group and for the organisation’s best interests. How they engage in their tasks make them stand out from the others and their work adds value to the organisation. Alienated: They tend to think independently and critically but are not really engaged with the bigger picture. The alienated follower will normally be disengaged from the group and will often see themselves as a victim and treated unfairly. Conformist: Staff that often say yes when they want to say no. They like to take orders and please others. An automatic belief exists that the leader’s position deserves obedience and questioning should be minimal. Pragmatist: They stay in the middle of the road. Although they question leaders’ decisions, it happens infrequently and not openly. Rarely do more than needed but the tasks they do complete, are often well done. “Better safe than sorry” describes them best. Passive: Little independent thinking and would like the leader to tell them what to do. Carry out their work with little enthusiasm, little responsibility and will need constant direction. a) Transformational Leadership: leadership that occurs when one or more persons engage with others in such a way that leaders and followers raise one another to higher levels of morality. This connects Followership Culture, with Learner-Centred schools (see below) and being aware of pathways (see below also) and follower types. b) Distributed Leadership: the expansion of leadership roles in schools, beyond those formal leadership or administrative posts. These range from simple tasks (e.g. maintaining the kitchen) to complex (e.g. filtering CVs for recruitment). This also requires leaders to ‘let go’ and have the confidence that the tasks can be done to an acceptable quality. The Disciple: Staff who carry the school message, culture and vision. They also promote the leader’s ideas. The Mentee: Staff who are looking to learn and improve. The Comrade: Staff who enjoy working together and forming relationships with others. The Loyalist: Staff who are supportive and always loyal to the leader. The Lifeway: Staff who believe the route of service and helping others is the best and most satisfying way of living. This links into servant-leadership. The diagram below explains the connections between each one. Finally, the organisational culture of a school (defined as the collection of habits) is a vital component in attracting and developing exemplary followers. One could argue it is the most important component. Thus, this cannot be understated and takes time, effort and constant pushing. 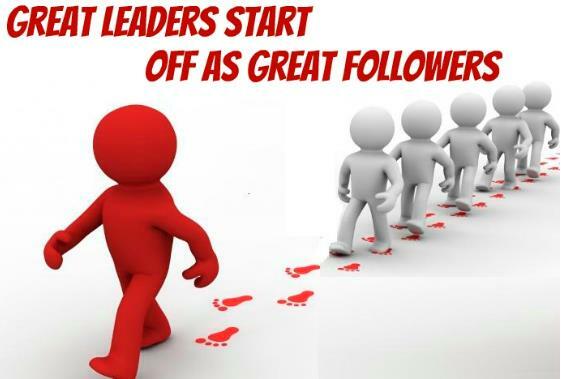 The creation of a Followership Culture involves staff being able to take the initiative, act immediately when a situation arises, use their imagination (creativity), ask questions and disagree professionally, keeps others involved and informed and last but not least, integrity plays a key part. These values can be explicit or implicit, depending on context but must be revisited constantly. Linked to the culture is the idea of a learner-centred school. Within our schools, all decisions taken should consider the student at the core. This enables a learner-centred school to be cultivated. It should be bottom-up in terms of decision making, taking into account all opinions and listening. Leaders should steer away from controlling behaviours and connect with staff. They should also realise that they too are on a spectrum that goes from leadership to followership on a daily basis. Leaders must find a way to connect the various dots in order to create the Followership Culture. It can be done by on the job training, followership education, implict and explicit training, shadowing and links to appraisal systems. However, buy-in to learn from all is important, as is accountability. Note: Followership was the theme of my dissertation for my MSc in Educational Leadership. A simple overview can be seen HERE. For the full dissertation with references shown, please contact me.